Whether it's a romantic weekend away or quick day trip from Melbourne, there's a lot of wonderful things to see and do in Daylesford and surrounds. After an incredibly busy three months working flat out, we needed to get out of Melbourne and recharge our batteries. We wanted a place where the pace of life was slow, the quality of food excellent, and above all somewhere we could relax. The answer? Daylesford. As one of the few spa regions in Australia, everything about Daylesford, Hepburn Springs, and the surrounds is rejuvenating; natural mineral springs, fresh local produce, and 1850's cottages converted into luxurious accommodation. Located an hour out of Melbourne, Daylesford seems built for that golden hour of sunlight at each end of the day in Autumn. Driving in, we were struck by just how gorgeous it was and pulled over straightaway, camera at the ready, to capture as much as we could. The stone and red brick cottages of the main street are illuminated by rich light coming over the valley, and earthy autumnal tones everywhere create a feast for the eyes - reflecting its past as one of Victoria's most successful gold-rush towns. Looking for the perfect relaxing weekend getaway like us? Or are you visiting as part of a Victorian road trip? Daylesford might just be your place. Here are the best things to see and do. Daylesford's main street, Vincent St, is the perfect starting point to exploring the town. If you're keen on a little shopping (who isn't), there are an amazing range of boutique shops to get shop the latest trends. Daylesford is known for its incredible antique stores, and there are none better than Brick Lane Bazaar and Artedeco, both located just off Vincent st. They've got a huge range of vintage furniture, clothes, collectables, memorabilia, fine china, and books, which definitely caught Mim's eye. For those interested in a bit of history, there are many historic buildings including the Town Hall and the Post Office, both of which were built in the late 1800's during the prosperous gold rush. 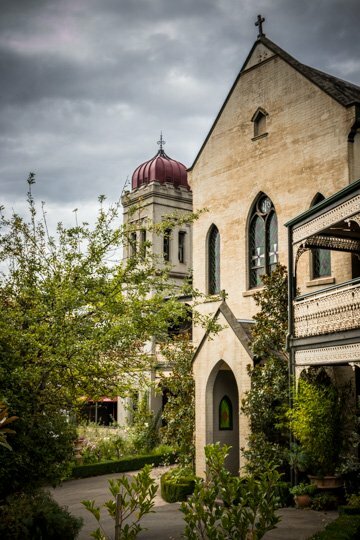 Nestled on a hill overlooking Daylesford, the Convent Gallery is a 19th century mansion with previous lives as a private residence, convent, and boarding school for girls, before it's 1988 purchase and conversion into a gallery, cafe, store, and museum. Described as ‘the most beautiful gallery in Australia’, The Convent houses seven galleries, and features fine art, sculpture, ceramics, glassware and textiles from over 100 local and international artists. The exhibition program changes every eight weeks, and showcases a range of traditional and contemporary artworks. One of our favourite things to do in Daylesford, however, was walking the immaculate grounds of Convent Gallery, admiring the beautiful architecture and stunning views of Daylesford! Around 30 minutes north of Daylesford is Hepburn Springs, home to the largest concentration of mineral springs in Australia, and the location for one of the best things to do in Daylesford - a proper pamper. At the centre of all the action is famous The Hepburn Bathhouse. Originally a timber building with a few baths built in the late 1800s, the bathhouse has since become a 'state of the art' bathhouse and spa facility. A visit here is perfect for those who want to relax, be pampered, and leave rejuvenated (don't we all?!). The Hepburn Bathhouse and Spa is split into two areas; the historical Bathhouse, which includes a general mineral bath and an invigorating spa bath experience. The newly built 'Sanctuary' is a more indulgent affair and offers a steam room, hammam, spa couches, and an outdoor bathing area, where you can soak in the lush Aussie bush setting. Sessions last for around 2 hours. Also located in town is the Hepburn Mineral Springs Reserve, which serves as the perfect place to get the blood pumping again after your pampering. It's also a great place to grab some natural spring water straight from the source, although be warned, it can be a little smelly and rather unpleasant to drink (but it's good for you!). Dating all the way back to 1862, The Farmers Arms feels like a traditional Aussie country pub; locals sit at the bar talking footy over a cold pint, while the fire place crackles, warming those entering from the brisk outside temperatures. Their slogan after all is 'Eat, drink, and be local'. Before our visit, we'd heard from multiple people that the Farmer's Arms was the best meal in town, and we can now confirm that this is true. We enjoyed a fantastic meal there on our final night in Daylesford - Pork Belly & Fillet Mignon, coupled with a nice red (and beer for Mark), and the kind of warm hospitality only a country pub can provide. It's also possible to stay at the Farmers Arms, in their stunning Art Motel. If you're looking for an authentic must-do in Daylesford, a meal or a beer at The Farmers Arms is a brilliant idea! After all the eating you've likely done, a stroll around Daylesford Lake is the perfect antidote. The lake was actually built in 1929, after the locals sought a body of water close to the main town. Despite being 'man-made', it doesn't stop Daylesford Lake from being outrageously pretty! It's about a 45 minute walk around the lake, with the picturesque jetty the perfect spot to unwind and have a picnic. You can also grab a bite to eat at the Boathouse, while there are also paddleboats for hire on the lake. If you're after something more challenging to walk off those calories, there are also many hiking trails, including the Goldfields track, which snakes its way from Ballarat to Bendigo, via Daylesford and Castlemaine. We were in Daylesford for a wedding, so naturally the day after required a deliciously hearty brunch. By chance we stumbled upon The Larder (or was it the line of locals waiting for their coffee? We can't remember! ), and don't regret our choice at all. Located on the Vincent St, The Larder feels like a Melbourne hipster cafe, and with brilliant coffee to match. The food is also wonderful - fresh and made on the spot. We had the big breakfast, which, maybe due to the great local product, was right up there with one of our favourite brunches ever. If you're after a hearty, quality breakfast or lunch, The Larder on Daylesford's main street is your place. Ten minutes’ drive north of Daylesford, down a Poplar-lined driveway brushed with autumn gold and through a timber country gate lies our of our favourite things to see in Daylesdord - a little slice of Europe with beautifully cultivated gardens and groves, colourful landscape, and charming stone cottages sprinkled around rustic cobblestone courtyards – Lavandula Swiss Italian Lavender and Olive Farm is the very picture of Provence. A new photo-opportunity is found around every corner as you wander thriving lavender fields, olive and chestnut groves, a vineyard, seasonal garden, and La Trattoria, a gorgeously rustic al fresco café serving gourmet fare. You could easily lose track of a few hours here (we did! ), relaxing in the gorgeous grapevine and ivy covered dining area with a lavender champagne (delicious). Check out our photo diary from Lavandula Swiss-Italian farm for more inspo! About half an hour from Daylesford, nestled between the Macedon Ranges, Spa Country, and the base of the Wombat State Forest lies the historic township of Trentham. Like most of Victoria, Trentham is a foodie paradise, with many great deli's and providores lining the main street. 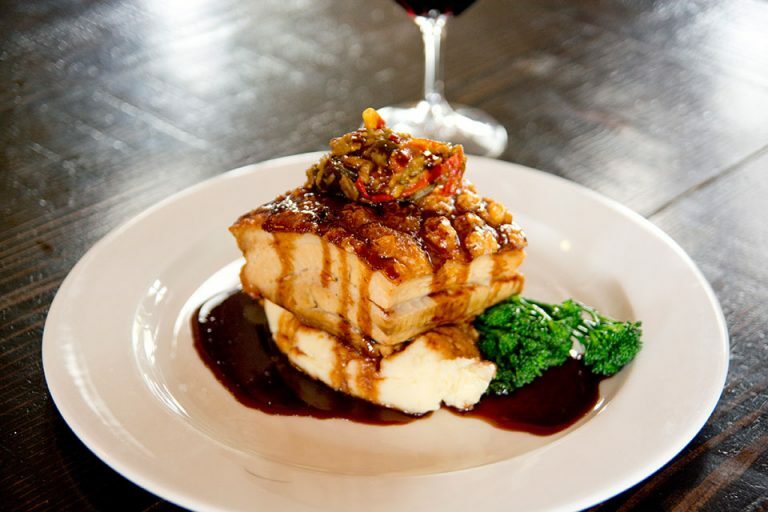 Be sure to indulge in seasonal local fare at the historic Cosmopolitan Pub too - voted 3AW's joint runner-up 'Pub of the Year' in 2013! Nearby are the epic Trentham Falls which drop over 32m, the highest single-drop waterfall in Victoria. Daylesford and Hepburn Springs are littered with absolutely wonderful accommodation options to suit any budget. We stayed at Indulge at Daylesford, an architecturally designed villa located right in the heart of town. Well be honest, we splashed out, but it was well worth the money. Alternatively, check out Hotels Combined to compare hotels, or look for the cheapest deals on hotels in Daylesford. From Melbourne, it's a 1.5 hour drive heading west along any of the Hume, Calder and Western highways, or via the Tullamarine freeway, to Daylesford (click here for a map). It's very well signposted (we didn't even get lost), so you shouldn't have any issues finding it. Once in the area, there's a great network of back roads that weave through the region to the essential areas of interest. V/line have several train lines that service the area. We hope this guide is helpful for you to enjoy a brilliant weekend (or day) away in Daylesford. If we've missed any of the best things to see and do in Daylesford, let us know in the comments!